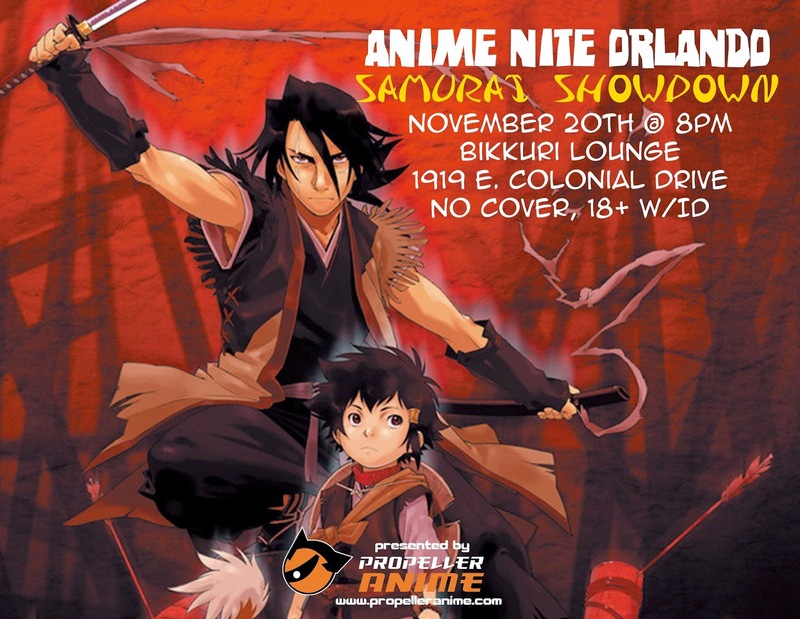 It's year nine of Propeller Anime and we kick off our first Anime Nite Orlando with a SAMURAI SHOWDOWN! No, we're not talking about the legendary SNK fighting games, but rather cool anime with some crazy sword fights! Anime Nite Orlando: Samurai Showdown will be Thursday, November 20th at Bikkuri Lounge, located at 1919 East Colonial Drive, near Mills Avenue! Doors open at 8pm and this event is FREE! However, you must be at least 18 years of age with a valid ID! Our main feature of the night will be a fantastic action-movie we have been wanting to show for years! Directed by Masahiro Ando(Under the Dog) and produced by BONES, it is Sword of the Stranger! Hunted by the Mings from China, young Kotaro and his dog meet a nameless samurai ("Nanashi") who is constantly being haunted by dreams of the past which lead him to seal his sword. Among the Mings is a fiercesome Western fighter named Rarou, who desires only to find a worthy opponent. When both groups clash with a Sengoku-era feudal lord, a proud general, and monks torn between faith and survival, the reason behind the Mings' pursuit tests the bond between Kotaro and Nanashi. But that's not all! We have a special treat to start off the night as well! We will also show the first two episodes of Katanagatari, which aired on Fuji TV's famed notamina block last year. It has an unusual art style, but we like things that way! Katanagatari is the story of Yasuri Shichika, a swordsman who fights without a sword, and Togame, an ambitious strategist who seeks to collect twelve legendary swords for the shogunate. The son of an exiled war hero, Shichika is the seventh head of the Kyotouryuu school of fighting, and lives on isolated Fushou Island with his elder sister, Nanami. At the request of Togame, Shichika sets out on a journey across Edo-era Japan to locate the Deviant Blades, all wielded by formidable opponents. But, in order to prove his loyalty to Togame, who has been betrayed before, and relies on neither money nor honor, Shichika must fall in love. As always, it's going to be a very exciting night with awesome anime and cool friends and we cant wait to see everyone! For those not familiar with Anime Nite Orlando, in addition to anime being showcased, Bikkuri Lounge has a full bar and a restaurant with great Japanese cuisine available to order. Drink specials for the night are 2-for-1 beers and $3 well drinks. Summaries courtesy of Anime News Network Encyclopedia.